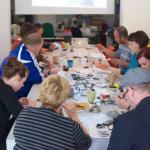 Patchworks was a co-design and co-develop project run by collaboration between Lancaster University researchers, Signposts (a charity working with homeless people in Morecambe) and MadLab (a team of Manchester community oriented techies). I joined the Catalyst team 6 months into the 8 month project, just as ideas were coming together about what kind of thing would be developed. 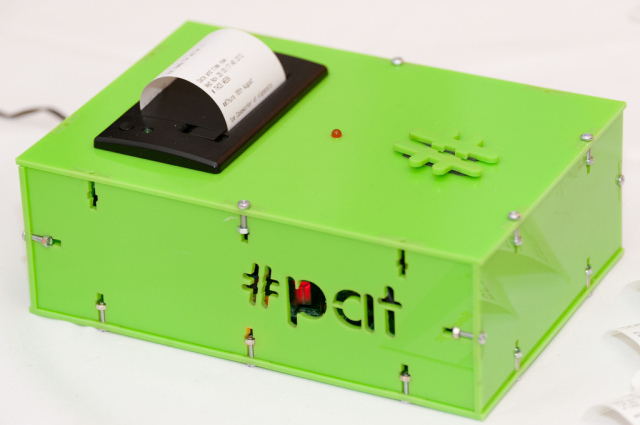 In the space of about a month and a half a reminder system called #Pat was envisaged, designed and built. My major role was to lead the building of the system – to take it from ideation through paper and hacked together prototype to a working implementation that could be tested ‘in the wild’ by Signposts volunteers. We needed a mechanism that users could carry with them – one which would not have any monetary value, personal attachment or complex interface for the reason that homeless people live chaotic lives and such items may get lost along the way. So the idea of using a printed reminder was settled on – and users are identified by a unique RFID chip. Such chips are small, inexpensive (<£1) and easily replaced if lost. To save time, complexity and learning curve the back-end of the system was built using email – therefore no special training or extra login passwords was required by the Signposts team. Such technologies are clearly no longer novel, but of interest is the process and methods by which the researchers worked in partnership with the community groups to co-design and build a solution to address community needs. 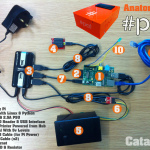 The printer, known at #Pat, is powered by low cost and open source technologies including Raspberry Pi, Linux, Python and IMAP email.